Westonite Julie O’Connor is one of a small group of photographers whose work has been selected for the Images 2014 show, sponsored by the Fairfield Museum and History Center. The show’s gala opening is Saturday, May 10. 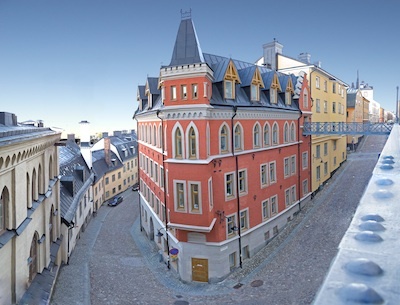 Ms. O’Connor’s photo, entitled “Bellmansgatan 1,” is a panoramic architectural image of a street scene in Stockholm, Sweden. The title refers to the apartment building at that address, where the fictional journalist, Mikael Blomkvist, was said to live in The Girl with the Dragon Tattoo and other books in the Millennium trilogy written by Swedish novelist Stieg Larsson. More of Ms. O’Connor’s photographs of Stockholm, as well as her other work, including the images for her book Doors of Weston: 300 Years of Passageways in a Connecticut Town may be seen on her website, julieoconnor.com. A three-person jury selected about 50 photographs for exhibition in the Images 2014 show, which will be on view at the Fairfield Museum from May 10 to June 22. The Images 2014 gala is Saturday, May 10, from 7 to 11 p.m. For more information, call 203-259-1598. Larsson as an author and the unforgettable power of his character, Lisbeth Salander. A Darker Shade of Sweden, edited by our colleague John-Henri Holmberg (co-author of The Tattooed Girl: The Enigma of Stieg Larsson and the Secrets Behind the Most Compelling Thrillers of Our Time), introduces English language readers to 20 Swedish crime writers. Published by Mysterious Press, the book includes stories never before published in English from Stieg Larsson as well as his partner of three decades, Eva Gabrielsson. In her current bestseller, The Goldfinch, author Donna Tartt gives an intriguing and slightly backhanded tribute to Larsson when one of the characters discusses his reaction to Dostoevsky’s classic, The Idiot. Boris, an important character in this gripping, neo-Dickensian tale, says that The Idiot so disturbed him he never wanted to read fiction again. The Girl with the Dragon Tattoo is the only novel he mentions by name that he has read since his last experience with Dostoevsky. The spirit of Lisbeth Salander continues to show up in literature and culture in many ways. Our guest blogger Jill Yesko, for example, has just published a novella, Murder in the Dog Park, whose protagonist is inspired by Lisbeth and Yesko’s deep interest in the Larsson series. Meanwhile, if you are looking to Nordic culture for a European update to The West Wing or for a more optimistic and more female point of view on politics than House of Cards, you should check out Borgen, a Danish television series dealing with the life and times of a fictional first female prime minister of Denmark. (The actual first female prime minister of Denmark was elected shortly after the TV series began airing.) We think Stieg Larsson would have liked this. Eva Gabrielsson, Stieg Larsson’s lifetime companion, made headlines around the world in February by giving Sweden’s leading newspaper access to fifteen boxes of Larsson’s research into the 1986 assassination of its then-prime minister Olof Palme, a murder that has never been solved. Palme had been a hero to many Swedes, including Stieg Larsson and Eva Gabrielsson. But Palme’s populist, left-wing, anti-colonial, and anti-apartheid views also made him many enemies, particularly among right-wing extremists. Given that long before he created Lisbeth Salander, long before there was Expo, and even long before Olof Palme was shot, Larsson was already exposing neo-Nazis and other nationalist groups, it was natural for him to look into possible links between those movements and the Palme assassination. According to reports in Spain’s leading newspaper, El País, there is a real-life hacker calling herself “Salander” after Stieg Larsson’s fictional Lisbeth Salander made famous by the Girl with the Dragon Tattoo series. The new Salander apparently operates from Melilla, the small Spanish enclave in Morocco. She has been gaining access to Spanish government files and publishing them online. “Spanish daily newspaper El País reported on Sunday that for the past two years the shadowy internet personality has been hacking her way into state institutions, then publishing them on the web to highlight corruption and wrong-doing. The Facebook page where she published most of the documents has been closed down and the “Spanish Salander” remains unidentified.In an interview with El País, she claimed she started her online campaign because she was “sick of people being scared to have opinions or rebelling”. She claimed that the political classes of Melilla had “exploited the geographical barrier of the Mediterranean to create an alternative, parallel reality”. One of her most notable achievements is providing inside information concerning the abuse of patients in a state-funded mental institution. This information led to an employee being fired for hitting a patient.According to El País, “Salander the second” has now gained cult status in Melilla. The paper says she was a popular choice for chirigotas – folk songs composed especially for a town’s carnival and adapted to political or social issues. Salander may also be a particularly interesting fictional character to people in Melilla since Larsson set a number of memorable scenes for Salander’s super-heroine talents in Gibraltar, the best known enclave in the region, located between Spain and Morocco. Since Steig Larsson’s trilogy–The Girl With the Dragon Tattoo, The Girl Who Played With Fire, and The Girl Who Kicked the Hornet’s Nest–became a publishing phenomenon in 2009, the title themes have been adopted by a whopping 91 other books. A rather surprising 23 percent of them were used on children’s books, and even though sales of the trilogy have been tapering off, far more of them were published last year (36) than in 2012 (19). The list was originally compiled by New York Magazine for its February 3, 2014 issue and can be found here, on vulture.com. But would Larsson himself have approved? Duomo from Palazzo Vecchio. Photograph by Julie O’Connor.